Dumbells and kettlebells. Sweat and signs. Chaos and accomplishment. 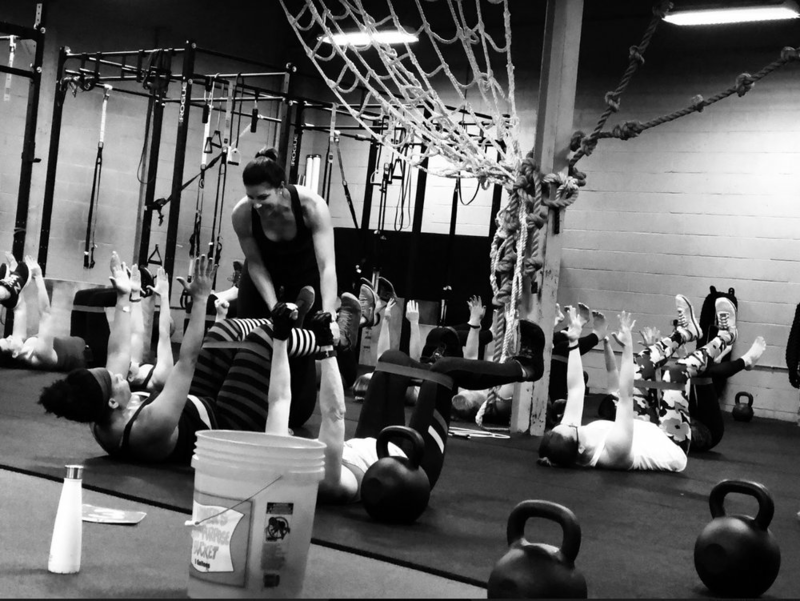 This is the scene at Hamden’s Tuff Girl Fitness gym, and inspiration bleeds from Christa Doran, the gym owner and fitness trainer who had to learn her own lessons in the worst way imaginable. The gym Doran built with her inspiration and commitment forged into a community. But in 2018, a personal tragedy rocked Doran to the point she would need that community to survive. Doran, a 39-year-old wife and mother, founded Tuff Girl in 2011, just after the birth of her second child. Originally from West Springfield, Massachusetts, Doran has been in the fitness field for a long time. She went to school for occupational therapy with the mindset that the two were similar. “But (OT) didn’t fill me up in the same way fitness did,” she said. Though she earned her Master’s of Science in OT, she found satisfaction running classes at the gym during her graduate years. When she realized where her true passion lay, she began pursuing that path even when her professional life was momentarily put on hold. After marrying her husband Mike Doran and giving birth to their first of three daughters, Livia, she left her job in OT to become a stay-at-home mom. It was not long before she missed working. “I didn’t want to work when I had kids because I wanted to focus on my children, but I couldn’t help but feel like something was calling my name,” Doran said. Three months after Livia was born, she decided to try something different. Being new to Hamden at the time, she didn’t have friends in the area. “I wanted a community and a connection with women,” Doran said. She started running group classes for women at East Rock Park in New Haven. She bought simple equipment and led group workouts. Women were even free to bring their babies. Through word of mouth, the unofficial business of Tuff Girl grew over the next 18 months. With the help of her business-savvy husband, Doran set to work on this new goal. Mike, who has experience in business as well as a degree in exercise science, helped her to find a physical space, get the lease, licensing and registration. When Doran, who had been pregnant during the whole process, was ready to have her second child, Mike decided to leave his job in surgical sales to join the Tuff Girl team full time. Together, they have been growing the business since 2011. Doran has hired and trained a number of coaches and Mike now leads co-ed barbell classes and programming. It was this atmosphere of never-ending support and empowerment that drew in coaches like 26-year-old Hillary Maxson. Having started as a Tuff Girl intern three years ago, Maxson is now a full-time coach. Maxson is just one of the hundreds of lives Doran has changed through her hard work and dedication. Barbara Esposito of Hamden is a Tuff Girl member who has been going to the gym four to five days a week for the past nine years. As someone who has trained with Doran since 2010, a year before the gym’s opening -- Esposito has come to know her on a more personal level. Esposito credits Doran for teaching her that being beautiful doesn’t come in the form of skinny. As someone who battled anorexia from a young age, Doran knows all about the difficulties of self-love and acceptance. This image is a far cry from the Doran, chiseled and fit, many people know today. Clients like Esposito can attest to this. “There is a thread of empowerment and feminism that’s weaved through here,” Esposito said. “It’s not a competitive environment. People really support one another here,” Esposito said. Tuff Girl has more 550 clients that train regularly and sees approximately 4,000 visits a month. Despite the success of Doran’s business and career, the past two years have brought her personal life an insufferable amount of pain and hardship. The horrific reality hit in May 2018 when Doran’s 6-year-old daughter, Lea, lost her battle to brain cancer. She died just nine months after her diagnosis August 2017. Doran leaned on her immediate and Tuff Girl family during this time of extreme grieving. Nearly a year has gone by since Lea’s death and Doran continues to be a pillar of courage. Returning to work just three months after Lea’s death, Doran said her work has given her a small reprieve from the pain. In addition to her job, Doran found solace in other ways. Around the time of Lea’s diagnosis, she started a blog called “Lessons from Lea,” where she could pour her heart out in an honest and unfiltered fashion. The reactions the blog received shot far beyond her expectations. People were grateful for letting them so deep into her soul. “Lessons from Lea” may have started as a way to cope with Lea’s death, but it has since become an outlet for Doran when she feels the need to write. “When I have something to say or when I have a story to tell that I think could help somebody, I want to say it,” Doran said. Doran hopes to one day write a memoir about her family, her work and of course, Lea, from whom she said learned so much. Even through her devastating loss came a lesson about herself and her own strength. Doran has made the choice to continue living her life in the most meaningful way she knows how. By being there for the people and the things that matter the most. Messages about love, strength, empowerment and self-worth are all ones she relays to both her clients and her girls on a daily basis. For more information about Tuff Girl Fitness, click here.